Textured concrete fence walls provide an attractive elegance that CMU block and other masonry fencing materials cannot replicate. StoneTree® Precast Concrete Fence Wall sections are vertically cast, ensuring that each section has a highly defined brick, block or stone texture formed on BOTH sides of the fence wall. The attractive and seamless appearance of StoneTree® Fence Wall Panels provide aesthetically pleasing views of the textured concrete fence wall from every angle. 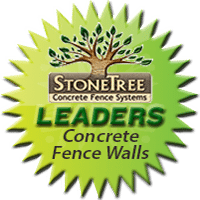 StoneTree® Concrete Fence Wall sections are vertically cast in forms which utilize reusable form liners. To add a unique, decorative touch to the fence walls’ vertical surfaces, the concrete form liners may be designed to accommodate custom textures in geographic shapes and patterns. Corporate, HOA or municipal logos may also be included in either the panel or the column section of the fence wall to reinforce brand messaging. StoneTree® Fence Walls are versatile, easily integrating ornamental fence elements such as wrought iron, logos and lighting. StoneTree® Fence Walls may be finished with decorative colors and finishes to match the exterior landscaping and decor. A variety of colored concrete stains are available to enhance the rich, organic natural appearance of stone wall textures, while also complementing the color palette of the surrounding environment. Fill out our form to the right, or call today to learn more about our stone wall texture!